Planning to stay in Miami near the port the night before your cruise? That’s always a great idea. Between traffic, airport delays, bad weather, and even computer shut-downs, there’s no good reason to risk coming into the city the day of your cruise. Doing so just increases the risk of missing your ship. If you plan to drive in and stay in a hotel before your cruise, we’d recommend finding a hotel with cruise parking. This can save you a considerable amount of money over parking at the Port of Miami. If you are flying in, then finding a hotel with a shuttle to the cruise port is ideal. That way you don’t have to worry about how to get to your ship on the day to cruise. The good news? Since Miami is such a tourist destination — especially for cruising — many hotels cater to cruise passengers with shuttles to the port. To help you out, we’ve rounded up a list of 24 hotels that offer a shuttle or other transportation to the Miami cruise port. Some of these may charge for the service, but expect the cost to be minimal. With so many hotels in the Miami area, don’t think this list is exhaustive. However, it’s a good starting point for those hotels with cruise shuttles. 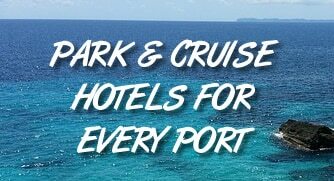 More Hotel Ideas: You can also click here to see inexpensive hotels near the Miami cruise port or see “Park and Cruise” hotels in the port area. Click on each hotel name to read reviews on TripAdvisor. Prices are based on a recent search for a Saturday night stay. Enter the dates of your stay for the most accurate pricing. For hotels that offer shuttles through a package, you may have to book through the hotel website, which is linked on TripAdvisor. This hotel is right on Biscayne Boulevard in downtown Miami and just about five minutes from the port. In fact, from some rooms you can actually see the cruise ships. It’s a trendy, modern hotel as you’d expect in the middle of a cosmopolitan mecca. They offer shuttle transportation to the port when you set off for your cruise for just $8 per person. Simply let the concierge know you’ll need a ride when you check in. Hampton Inn is known for a solid hotel at a good value. This location is no different. This hotel sits just off the airport property to the south. Included in your stay are breakfast, use of the pool, business center, and fitness center. The hotels offers a “Stay and Cruise” package featuring one-way shuttle service for two to the cruise port. Additional riders are only $10 each. Located just north of the airport, this hotel is only about 8 miles from the cruise terminals. As you’d expect from the chain, you’ll get free wi-fi, breakfast, pool and fitness center with your stay. It also has free rides to and from the airport. For cruise passengers, this hotel offers a free shuttle to the cruise port. If you want a return ride, then it’s $10 per adult. As for value and convenience for passengers flying in, it’s tough to beat. Just a short drive through downtown to the cruise port, this Hampton Inn offers a great location for those who want to be near the action in the heart of Miami. Best of all, they offer a cruise shuttle of $8 per person that leaves several times per day. Want to save money? You can also right the Coral Way Trolley for free, that runs to the cruise port. The Brickell stop is just a short walk (0.2 miles) from the hotel. South of downtown, this hotel is a good idea for those who want to be near the port, but don’t want to stay in a busy spot. In fact, you can have three different views — the bay, the city, or the pool. Meanwhile, you are still near a lot of things to do in see. Most importantly, you’ll be about a 10-15 minute ride to the cruise port on embarkation day. A shuttle runs at 11 a.m. and 12 p.m. each day, at a cost of $10 per person (with a two-person minimum). This high-end hotel is one of the closest to the cruise port, and offers some of the most stunning views. It sites right on Biscayne Bay, where you can see the cruise ports docked just a mile or two away. The DoubleTree offers a “Cruise Escape Package” that includes a room, breakfast and transportation for to to the Port of Miami. That’s not a bad way to start your embarkation day. While many hotels in downtown Miami are trendy boutique hotels, you can still find affordable, comfortable options. One of the cheaper options in the downtown/Brickell area, the Extended Stay America offers comfortable accommodations at a reasonable price. They also offer a shuttle to the cruise port that costs $8 per person. It runs Monday through Friday, but unfortunately no service on the weekends. If you need a ride on Saturday or Sunday, your best option is taking a Lyft or Uber. Looking more like a modern condominium building than a hotel — and just a few minutes from the port in Brickell, near the downtown area, — the Homewood Suites are a convenient option. It’s also clean and new. As for a shuttle to the port, they offer a third-party service that costs $10 per person. Departures times are at 11 a.m., 12 p.m., and 1 p.m. You’ll just need to let the front desk know you want a ride when you check-in. The location for this hotel is both good and bad. On the good, it puts you near the port, between the airport and the cruise port. On the bad, it’s situated right next to a major freeway. All told, this hotel puts you only about 12 minutes from the ship on cruise day in a modern, comfortable room. They offer a third-party shuttle that picks up three times a day (10:30 a.m., 11:30 a.m., and 12:30 p.m.) that costs $8 per person. It’s difficult to beat the location or the price of this hotel. However, it reviews aren’t that great. Many past guests say the hotel is in need of updating. Still, it’s easy to find rooms for under $100 per night. One of the absolute closest hotels to the Miami cruise port, you could walk to the ship if you wanted to. That said, there is a complimentary shuttle to the port that departs at 10:45 a.m. Just let the front desk know at check-in and they will make sure you are squared away for your ride. Situated just north of the airport, this older hotel is quick to get to if you are flying in for your cruise. It’s also common to find rooms for cheap. Runway Inn features a free shuttle to the cruise port for its guests. As one of the best mixes of value and comfort, Hampton Inn is a good choice for cruise passengers. As you’d expect from the hotel chain, it offers of clean accommodations before your cruise. For under $200 you can get a room just a few miles from the port. The location is a little farther than some other hotels on our list. Still, they offer a parking package that includes free parking for your stay plus a shuttle to the cruise port. If you don’t have a car, you can just take advantage of using the shuttle to get to the cruise terminal. Located about 14 miles from the cruise port, the Holiday Inn Express near the airport has a “Fly N Cruise” package that offers a shuttle to and from the airport and one-way transport for up to four people to the Port of Miami. It also includes up to seven days of parking. As for the hotel, it gets strong reviews, featuring updated rooms, breakfast, and a pool. Coming into Miami to see all the sites and enjoy the nightlife? The Hyatt Place near the airport might not be the ideal spot for you. Want a well-reviewed hotel that’s a solid choice before your cruise? This is it. This hotel not only offers a third-party shuttle to the Miami cruise port for its hotel guests, but they will pick you up for your flight as well. The shuttle for the cruise port leaves at 10:30 and 12:30 on cruise days and costs $12 per person. Near the intersection of Palmetto Expressway and NW 36th, this hotel sits in a small group of options that all cater to cruise passengers. While reviews mention the hotel could use an update, they have a “Stay & Cruise” package that includes parking, breakfast, and a shuttle to the cruise port. After your trip, they will pick you up with a ride (for a fee) back to the hotel or the airport. One of the more comfortable hotels in the airport area, the Hilton Garden Inn is relatively new, which is always nice. Plus, with the Hilton’s “Park, Stay & Go” package you can park for the duration of your cruise. If you don’t have a car, then just use the shuttle to the cruise port to start your vacation. Rates to the port are $12 per guest, one-way. There is also a “Park and Cruise” package that includes a breakfast buffet, 15 days of parking, and included shuttle to the Port of Miami. Perhaps the most unique location of any hotel in our list, the Hilton is more like a resort. It sits on a peninsula south of the airport, surrounded by water. In other words, you don’t have to worry about the noise of the city in this oasis. The hotel offers a shuttle from Friday-Monday for $15 per person. The trip takes approximately 30 minutes to get to the cruise terminal. While other budget hotels might not get great reviews, this one actually does. Instead of a massive building full of rooms, this property is actually made up of a number of smaller buildings, offering more of a resort feel. Hot breakfast is also served daily. The third-party shuttle offers a ride to the port every hour between 9 a.m. – 12 p.m. It costs $13 per person and you’ll need to purchase in advance to ensure a spot. The ride takes about 30 minutes to the port. Just minutes from MIA (and with a free airport shuttle), The Courtyard Miami Airport offers comfortable accommodations. It also has a surprising amount of outdoor area for you to relax. With its “Extend Your Miami Cruise Experience” package you can get a room, breakfast for two and transportation to the Port of Miami. You’ll use code “TRS” when booking. Adjacent to the Courtyard listed above, this is another great option near the airport. In fact, it offers up some of the best reviews of any hotel on our list. As with other hotels in the immediate area that are part of the Marriott family, the Residence Inn offers an “Extend Your Miami Cruise Experience” package with room, breakfast and transportation to the port. Another Marriott property next to the Courtyard and Residence Inn mentioned above, this hotel has the same package offering a room for two along with breakfast and a ride to the ship on embarkation day. As well, you can get a ride to and from the airport, lounge by the updated hotel pool or simply relax with a little sunshine before your cruise in the hotel’s outdoor area. This hotel is just north of downtown Miami and about 10 minutes away from the cruise port. It’s also convenient to the freeway that runs to Miami Beach if you want to go see the famous South Beach before you catch the ship.With the “Stay and Cruise” offer from Hampton Inn you will receive a room and transportation for two to the cruise on the date of your trip. Note that the package also includes breakfast and wi-fi. Parking is available for $10 per night. Conveniently located near the airport, the Crowne Plaza is a nice option for those wanting to fly in the day before their trip. It’s an upscale hotel without the high-end price tag. As well, they offer a shuttle at 11 a.m. and 12 p.m. to the cruise port, for $15. You’ll want to let them know you plan to use the shuttle when you check-in so that they can reserve your spot. Miami’s Brickell area is hopping and this upscale hotel puts you right near everything. A short walk from both the Miami River and the bay, you’ll know you’re in the Magic City when you stay here. While not specifically mentioning a shuttle to the port, the location of the Atton is just a few minutes walk to the Coral Way Trolley stop. The trolley runs to the cruise port about every 15-30 minutes. Best of all, it’s free of charge so you can get a lift without spending a dime. Are there inexpensive hotels near the Miami port with shuttles? Can I leave my car at the hotel while I cruise? Parking at the Port of Miami is expensive. You can save by selecting a hotel near the port with a shuttle and that lets you leave your car. A number of hotels have “park and cruise” specials that offer just the thing. 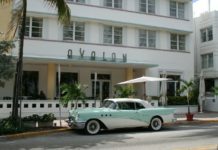 See our article on Miami hotels with cruise parking. What area of Miami should I stay? The city offers a lot of options depending on your needs. Want to see the classic Miami beach scene? Try a hotel in South Beach, about 10 minutes from the port. Simply want somewhere affordable to stay? Hotels near the airport can be just the thing. Just want to be near the port? Try the downtown or Brickell area which is nearby but also has a lot to do. It’s always good to find quick and reliable services before you go on your trip. Thank you for the suggestions for looking for a good hotel to meet the needs of travel with shuttles to your port etc. Thanks for the list of hotels that include these services.